BODHICHARYA KENT is delighted to be screening NURTURING COMPASSION, the latest release from Crestone Films, with thanks to our friends at Crestone Films, notably David Scott, Vice President of Operations. NURTURING COMPASSION is the continuing story of the Seventeenth Gyalwang Karmapa (www.kagyuoffice.org/karmapa), leader of the Karma Kagyu Lineage of Tibetan Buddhism, and his tour of Germany in 2014, his first-ever visit to Europe. 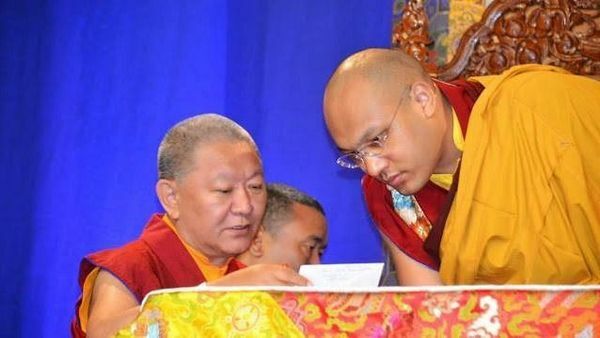 Following in the footsteps of his previous incarnation, genuinely regarded as one of the 20th Century’s great saints, the Karmapa faces major challenges. Still a young man, he must live up to the legacy of his predecessor and guide his lineage through challenging and difficult times. Illustrated by archival footage, the film—and the Karmapa himself—give an account of his happy early childhood in Tibet, before his recognition and subsequent daring midwinter escape into exile in India. The Karmapa wishes to engage in the modern world and explore the ways in which he and his lineage can understand and contribute to the seemingly intractable environmental, social and political difficulties that afflict it. The film features Ringu Tulku Rinpoche, who is the President of Karmapa Foundation Europe (www.karmapafoundation.eu) and Founder of Bodhicharya (www.bodhicharya.org), who played a major role in helping bring HH17th Karmapa to Germany in 2014, as well as serving as his principle English translator during the teaching tour. The evening will begin with the recitation of the Refuge Prayer to the Three Jewels: the Buddha, the Dharma and the Sangha, which will be proceeded by a period of guided meditation. We will then watch NURTURING COMPASSION together with refreshments provided. The evening will conclude with the recitation of the Dedication of Merit but you would be most welcome to stay behind after for a cup of tea and a chat. Even though Crestone Films kindly did not request any donations for the public screening of NURTURING COMPASSION, a SUGGESTED DONATION of between £5-£10 has been suggested that shall be equally split between Crestone Films and Rigul Trust, Ringu Tulku Rinpoche’s Charity (www.rigultrust.org) to support the activities of Crestone Films and Rigul Trust. However, if you cannot afford the suggested donation, then you are still most welcome as your presence is ALWAYS more valuable than your money. We look forward to sharing this inspiring film with you and a look into the Heart and Mind of the Karmapa, one of the world’s luminaries and spiritual masters, who Bodhicharaya Kent is closely connected to through our main teacher, guide and inspiration, Ringu Tulku Rinpoche.